There is one week left to activate your chance to live your own Living Deep Time Calendar Year 000001, and gift the experience to friends. Calendar rewards are available until November 8th via our publications campaign. Living Deep Time Calendar Year 000001 includes a set of 46, 4.5” x 5.25” elliptical cards. The cards are composed of original artwork and photography resulting from our year of performative research. This calendar doesn’t simply track weeks and months – it puts you in relation to time-scapes that are much larger and much smaller than the ones depicted on usual desk calendars. Activated throughout a year, it offers an intimate experience for sensing how we, and all other beings and things, are made up of the times of other things and beings. 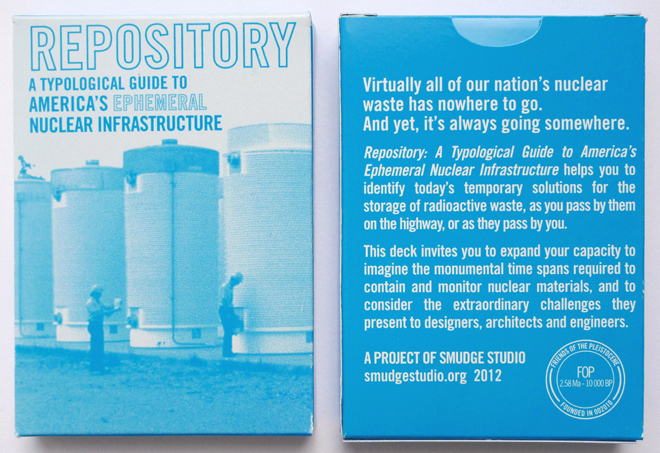 It invites users to sense material connections to the deep geologic past and deep geologic futures. Its invitation to creative engagement is designed to offer a means for discovering ongoing wonder and appreciation for time’s forces, challenges, and surprises in this new epoch called the Anthropocene.